Sheet music cover for 'Twiggy Voo?' as sung by Marie Lloyd, written by Richard Morton and composed by George Le Brunn. Published in London by Francis, Day &amp; Hunter and in New York by T. B. Harms &amp; Co., 1892. Before the use of gramophones and radio became widespread, the music sheet was the mainstay of the music industry. The explosion in popularity of parlour music in the late 19th century, with a piano becoming a fixture in the home, led to the printing of famous songs from the music hall stage. 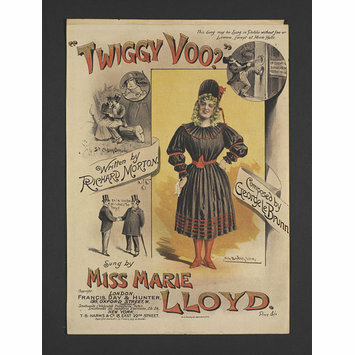 This music sheet is one of many that were issued with the words and music of songs performed by the music hall star Marie Lloyd. Marie Lloyd (1870-1922) had a career spanning 40 years. She first appeared at the Eagle Tavern in London aged 15 as Bella Delmare, singing ‘My Soldier Laddie’. By 1885 she had become Marie Lloyd with her hit song ‘The Boy I Love is Up in the Gallery’. She was a huge success and topped the bill at the West End music halls. Her songs were full of innuendo and double meaning. ‘She’d never had her ticket punched before’ and ‘Oh Mr Porter what shall I do?’ appeared innocent on first reading but took on a very saucy interpretation when performed by Miss Lloyd. 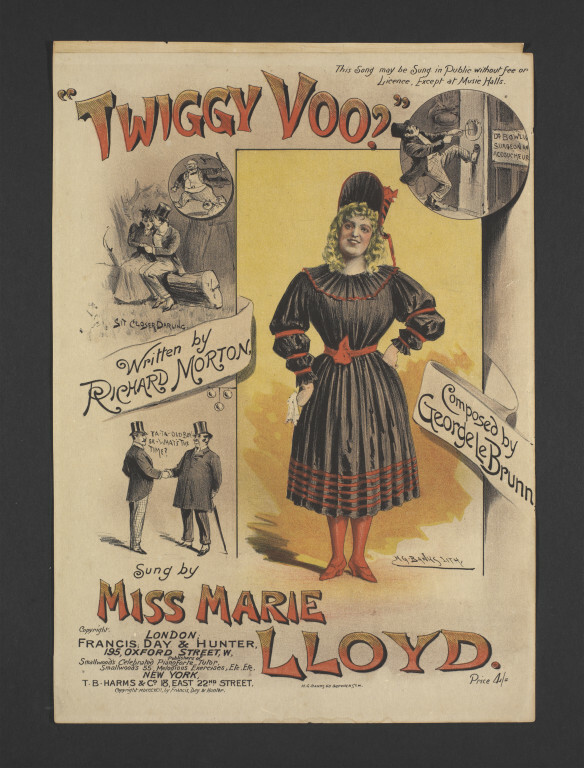 Music sheet cover for 'Twiggy Voo?' illustrated with a full length portrait of Marie Lloyd and scenes from the song.